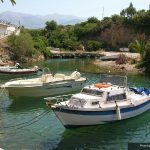 Sissi is a charming little fishing village situated on the east of Crete just 45km from Heraklion airport. 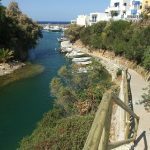 To find this charming fishing village just follow the national highway through the resort of Malia and you will see a sign to the village of Sissi at which point you take a left and follow the road which ends in the village. 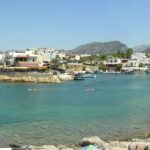 Sissi is one of the few villages on the eastern side of Crete that hasn’t felt the influence of the many tourists and holidaymaker’s that visit Crete every year. It remains a quaint little village reliant on fishing with only a few small hotels and Taverna’s. 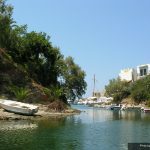 The most photographed part of Sissi has to be its wonderful port, this is at the end of the road you follow from the national highway, or the first thing you see of the village of Sissi when you visit by boat. When you first see the port or harbour its looks like an estuary or small river that runs into the sea, but it is in fact a feature of natural beauty that has been carved into the rock by the sea over the centuries. Over the years the Aegean sea has carved a long narrow bay which is now protected by a man made wall of stone which shelters the boats moored here from the winds and storm seas in the winter months. During the Cretan revolution the small port of Sissi was hidden well enough to become an area where guns and munitions were offloaded to arm the Lassithi rebels. Nowadays it’s firmly a fishing village with some excellent fish restaurants, many of the residents from local towns and cities including Heraklion and Hersonissos can be seen eating at the wonderful Taverna’s dotted around Sissi. Why travel this far for food when you live in Crete? 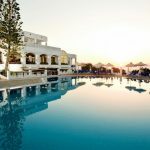 Its because Sissi is famed for its fresh fish and excellent chefs, and if the locals eat at a Taverna you know the food there is going to be excellent. Near the port you will find one of the 2 small sandy beaches, sheltered by the rocky outcrop from the strong winds that can gust over the island of Crete during the summer and winter. The beaches in Sissi are both well served with a small beach bar, and sunbeds are of course available to rent for a couple of euros per day. Another draw to the area of Sissi has to be the floral hotel garden, its loved by locals and visitors alike. Here in the hotel gardens you can enjoy peace and tranquility away from the hustle and bustle of daily life. You’re all but guaranteed good weather in Crete in the summer. Average temperatures are usually in the 30s, with around 12 hours of sunshine per day. It is rare to see rain in June, July or August with a chance in the early and late season. If you prefer things a bit cooler, spring and autumn see plenty of sun, but temperatures are a bit more comfortable, in the mid-20s. © 2006-2016 holidays2crete.com | Holidays and Travel Guides to Crete and beyond.